CCO Faith Studies provide a simple but personally challenging look at the Gospel message. 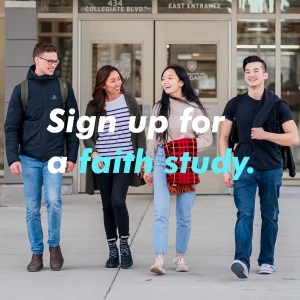 You can sign up to take a study at one of the campuses below. You can learn more about these studies by clicking here. Registration for Summer 2019 is now open. Have you led any of the faith studies? Would you be open to leading a faith study? Have you attended any CCO events? Which Summer Mission did you attend? Occasionally we send out big news and updates about CCO. Yes, please email me these updates. Please enter your availability by clicking on the box to indicate that you are busy. Once you submit this form, someone will be in touch with you soon.